7. What else I need to know? If the skin of your upper eyelid sags and blocks your field of vision, the surgery can actually improve your field of vision. As skin ages, it gradually loses its elasticity. A lack of elasticity, combined with the constant pull from gravity causes excessive skin to collect in the upper and lower eyelids. Excess skin on the lower eyelid causes wrinkles and bulges and on the upper eyelids an extra fold of skin forms which can hang over the eyelashes and obstruct vision. Bulges in the upper and lower eyelids can also be caused by the fat that cushions the eyeball from the skull. The thin membrane that holds the fat in place weakens with age, allowing the fat to protrude into the lids. Eyelid surgery can enhance your appearance and help build your confidence. However, it may not result in your ideal look or cause people to treat you any differently. Blepharoplasty will not alter your facial structure. It is important to know your face well before you decide to have surgery. Think carefully about your expectations and discuss them with your surgeon. 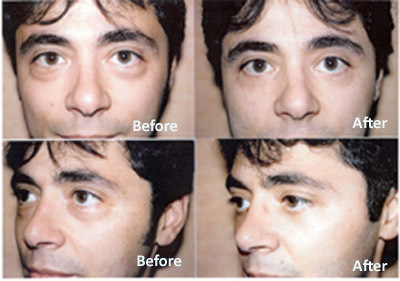 Blepharoplasty will not stop your eyes from aging. However, the procedure is usually very long lasting. Upper eyelid surgery can last anywhere from five to seven years to an entire lifetime, while lower eyelid surgery rarely needs to be done more than once.If your lids are once again sagging, the proper procedure is oftentimes a forehead lift,not another blepharoplasty. You will need to have another person drive you home after your surgery. You should also have someone stay with you the night of the procedure.